God is faithful! There were many things that God did to make our VBS a big success. The best part was how the children were eager to learn. When Carol taught a craft using the "witnessing beads" two children came back later to check and make sure they knew what each color stood for. Each day we had a review of the day before with a candy toss game. The children all had their hands raised ready to show they remembered. Sometimes they came up to me during the morning asking me questions and checking facts so they would be prepared for the candy toss game the next day. They even memorized their Bible verses. We had no fights or casualties. Everyone got along. We had good weather....it was hot but it didn't rain out our swimming days. It was a wonderful, full, week. I praise God for his wing sheltering us and guiding us. 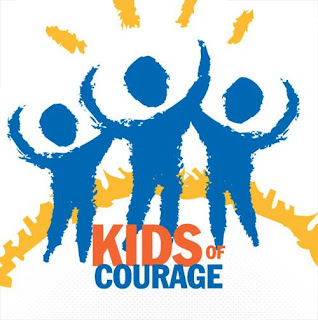 We used the Kids of Courage curriculum from Voice of the Martyrs. Each day we studied a different country where Christians are trying to proclaim the Good News in dangerous settings where the Gospel is not aloud to be shared. Our group of 11 people was ages 11 - 55. The difficult topic of being courageous in sharing our faith was paired with a Bible story in which people of God had acted courageously. The countries studied were: North Korea, India, Nigeria, China, and Egypt. We started everyday with worship. And the children acted them out. We learned memory verses. Below you will see a video of everyone signing the Lord's Prayer. Click on the arrow to "play". Carol and Lois brought T-shirts that we decorated with signatures and words of encouragement. We owe a BIG thank you to Lois Rhodes and Carol Rhodes who came down to Belize for 10 days to help with VBS. Your support and ideas and presence were a blessing to us. I also want to thank Water of Life Lutheran Church for your donation that made this VBS possible. Thanks!